The International Organization for Women and Development is an organization dedicated to its mission to help women with obstetric fistulas in Rwanda. 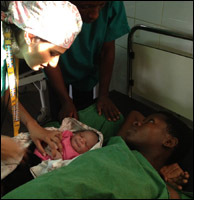 The group performs three surgical mission trips a year to Kigali, Rwanda. As a third-year Ob-Gyn resident from Brown, I traveled with its team of 25 medical professionals, urogynecologists, surgeons, nurses, gynecologists and anesthesiologists to Kigali, Rwanda in February 2012. We worked primarily at Kibagabaga district hospital in Kigali. Working 12 days straight, I assisted in the evaluation of over 100 patients and nearly 40 cystoscopies and surgeries. I primarily participated in postoperative care of women after surgical repair of vesicovaginal and rectovaginal fistulas. I was also able to spend time in Labor & Delivery and performed vaginal and cesarean deliveries with the hospital midwives and general practitioners. I assisted in the repair of a third-degree laceration from episiotomy with a Rwandan ob-gyn resident. My experiences in evaluating patients and participating in surgical and postoperative care of these women was incredibly educational. I learned how to simply and efficiently examine obstetric fistulas and observed many complex repairs that are rare in the United States. I reaffirmed a commitment to female pelvic medicine and a desire to continue work in resource-poor settings. I learned valuable lessons about what patients will put up with and am inspired to continue working to improve quality of life in patients.